You must make reservations at least 5 minutes in advance of the time at The Saratoga - San Francisco. Street parking a public parking lots are available. 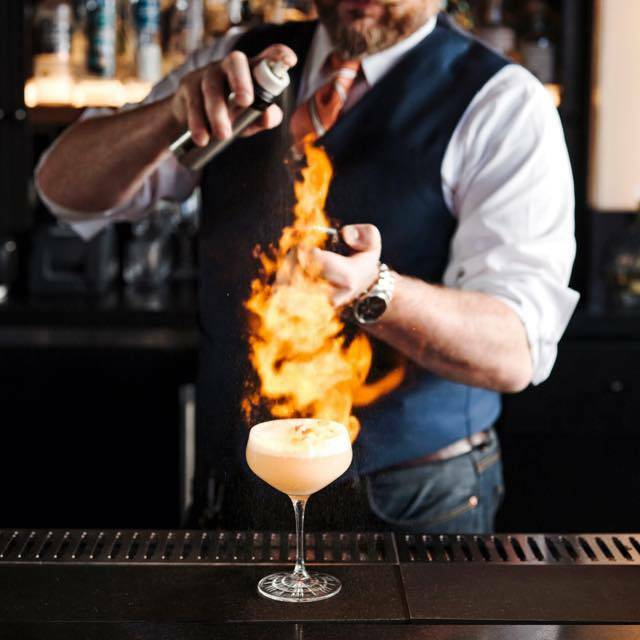 We offer one of the hottest happy hours ($5 drinks and dishes!) Monday - Friday, 5 - 6 p.m. Visit our website regularly for info about special tastings and distiller dinners. 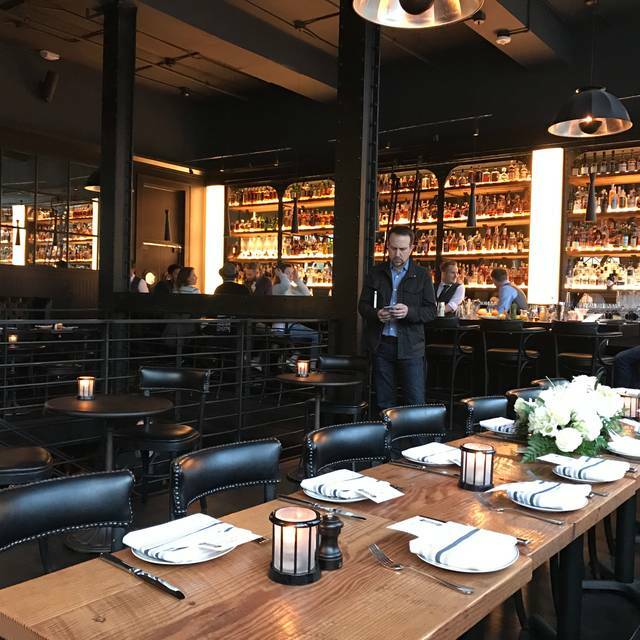 The Saratoga in San Francisco offers an exciting atmosphere to enjoy a drink with friends, as well as great food. Its swanky setting features two levels with a bar on each floor. 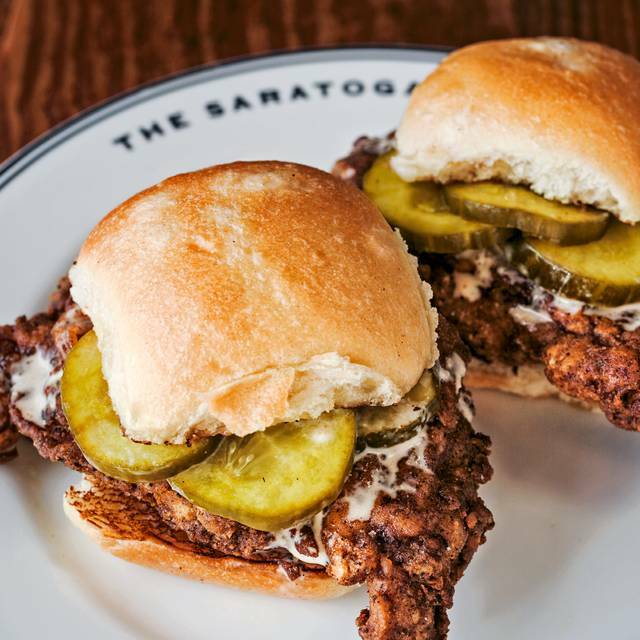 The Saratoga offers guests delicious small plates like chicken liver toast or housemade tater tots with Fiscalini cheddar and chorizo crumbles. It offers hearty dishes such as New York steak covered in a cognac-peppercorn sauce or Cubano Frank with slow roasted pork and a mojo relish. 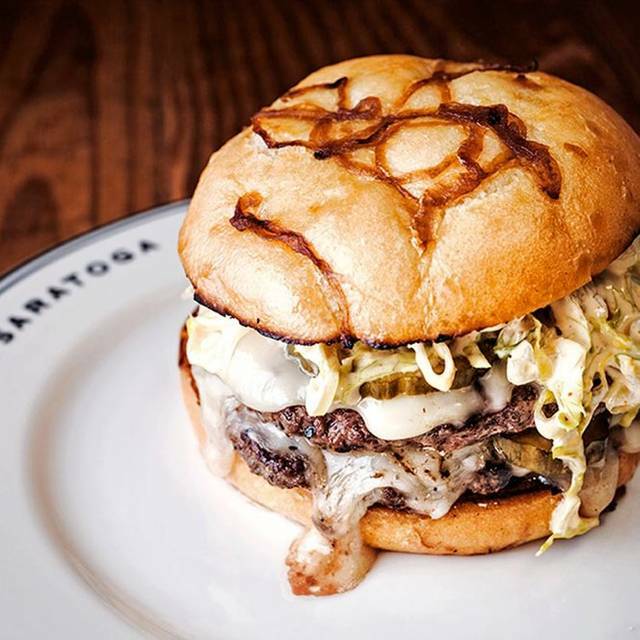 Award-winning burgers and flavorful salads are also on the menu. 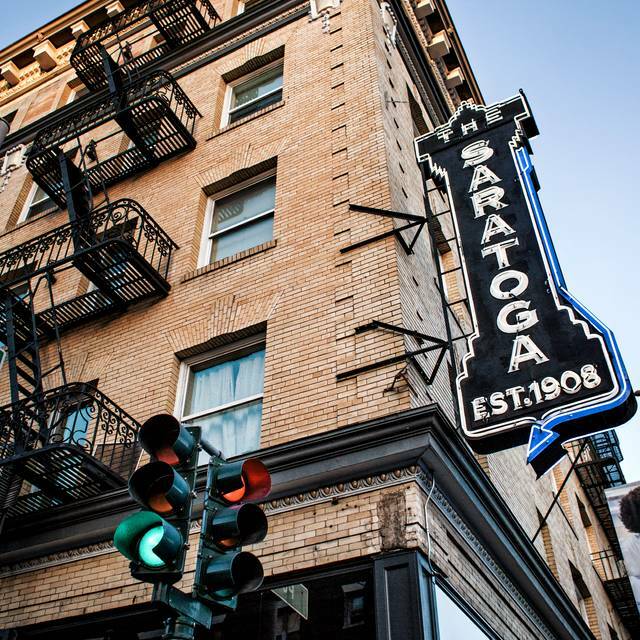 The Saratoga is featured in Eater San Francisco, as well as other publications. 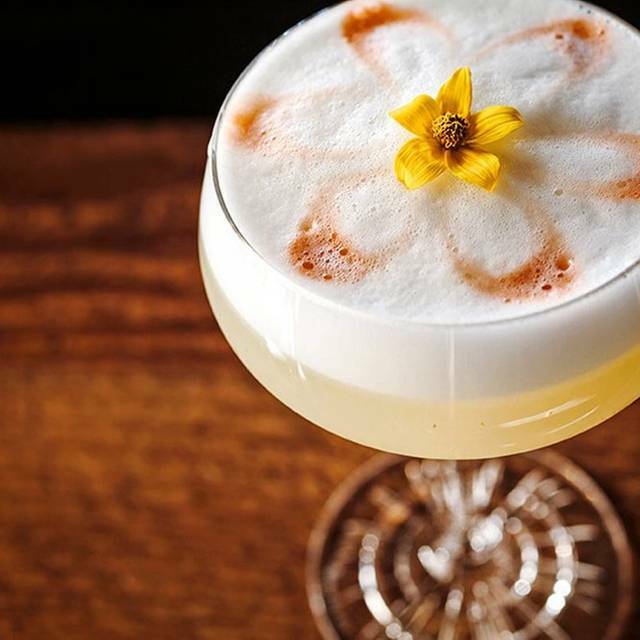 It's sizable bars offer a wide selection of spirits, cocktails and other libations. Enjoy a selection of 5 cocktail and 5 snacks each for just $5! Enjoy food and drink specials featuring Partida Tequila including Bloody Maria's and Breakfast Burritos! Show your Mother how much you care with extra special food and drink specials featuring: The MOM-Mosa, Cinnabuns, and the Dutch Baby Mama! Best French Toast ever! Delicious avocado toast, eggs Benedict, and drinks. We didn’t have a Bloody Mary but will have to try it next time because they looked fantastic! Wish our waiter had told us the Bloody Mary could double as an appetizer before we ordered. Great ambience. We got the burger and the Cuban hotdog. The burger had rave reviews online and it was meh at best. In and Out Burger I would rank higher. The Cuban hotdog was an interesting idea but just was also mediocre. The service was good. The cocktails were great. Lovely evening, amazing drinks, delicious dinner. Win. win! We will be back! 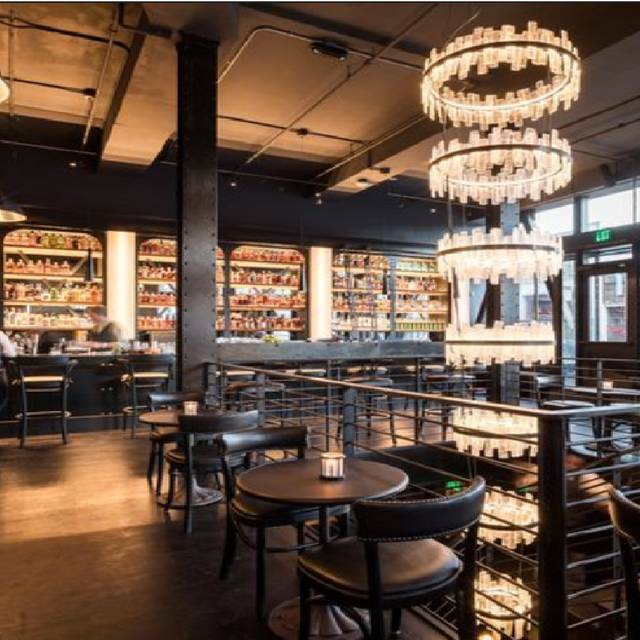 Fun mix of old club/bar with contemporary food. Great cocktails. I really enjoyed the food and the service here. It was our first time and I brought my husband for his birthday dinner. 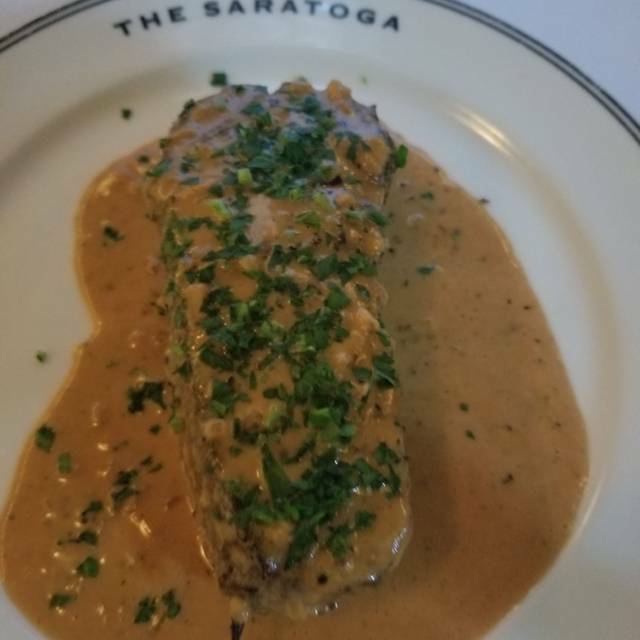 I had heard of The Saratoga from a friend and subsequently I started to follow their Instagram account and the food always looked good. The only negative I can say is we were expecting a much quieter area to be seated. We were placed right smack in between two big groups of diners of 5-6 people on either side. It was very LOUD. The tables were so close together and so loud we had trouble communicating with our waitress to order. It was odd they would plop us right in the middle of this setting. I was expecting a better talking environment and was actually hoping to be seated in the downstairs dining area which was closed at the time of our reservation. They didn't start seating diners downstairs until after 8PM or so. All in all, the food and service was great. Just beware that it can get loud upstairs and you must speak up if you would prefer a different table. I didn't say anything because I usually just go with the flow on my first visit to a new restaurant. 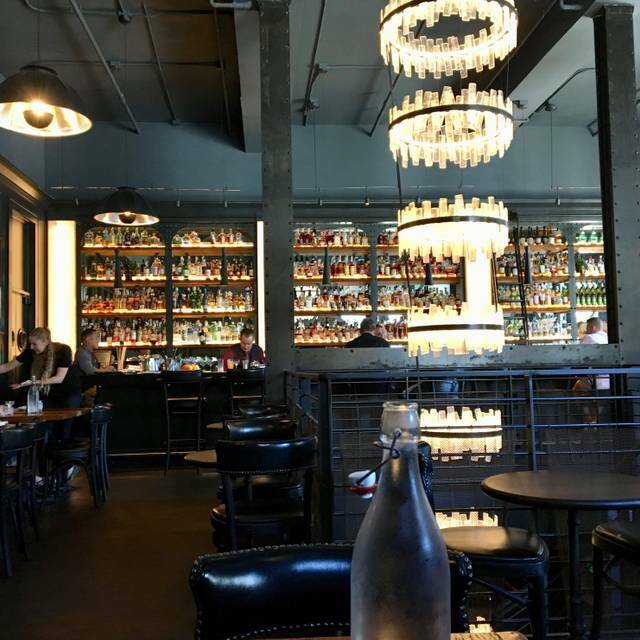 It’s a cool SF restaurant with a nicely done interior, it’t got the old look. High ceilings. Service staff is really good. Friendly. They work hard. The menu had some interesting choices. The carrots a la carte and the hamburgers are nice. French fries and mushrooms, nothing to speak of. Pretty basic preparation. We didn’t eat the mushrooms much but ordered another round of carrots. About 5 for $11 or $12. Hey it’s San Francisco. Huge drink selection, but no No 1 organic Tequila. They don’t cater to celiac, lots of cross contamination. I took a group of colleagues from out of town to what I thought would be a great dinner but turned out to be an embarrassing dining experience. Our sever although kind had a very foul odor. A few drinks were incorrect and he tried bringing us drink we didn’t order. The steaks were well-done when we asked for med-rare. He watched us complaining about them and did absolutely nothing. Solid food and service, nicely laid out dining room, but for the love of god buy some acoustic treatments for the room. Both breakfast and lunch options were delish. Tater tots and Bloodys are instagram-worthy! Enjoy! This place is amazing. From the drinks to the food, everything is great. The selection of craft cocktails was on point. The menu wasn’t huge, but everything on it was tasty. We sampled almost everything and loved each item. Not a bad choice in the bunch. The service is very good too. If you haven’t been, I highly recommend. Great place to dine, great vibe and staff was very friendly. The food was amazing. The Saratoga burger was perfectly cooked and the Tots!!!! Amazing tots have to try. Sunday brunch for a bachelorette weekend and everything was so amazing! The Saratoga was wonderful in dealing with multiple adjustments to our reservation (sorry again!) and our server was fantastic. We didn’t catch our name but homegirl was perfect. So kind, funny, great timing, solid suggestions, just the best server you could ask for when dealing with a table of like 12 women. She went out of her way to acknowledge the bachelorette and make us feel so special. And the food was sooooo good. Can’t say enough wonderful things, thank you for a killer experience! awesome cocktails and spirit selection. Fantastic food. the octopus dish was incredible. We loved everything we ordered. Not an extensive menu but the food we had was delicious and everything else made it a great experience! Nice food, mostly, but our server was terrible. He barely checked in with us. Also, the food was good with the exception of the billionaire’s bacon - really fatty! Delicious food and drink, I always love this place. Tots are outstanding and best burger around! Old school San Francisco Vibe. Well crafted food and drinks. The butterscotch caramel pudding was the best. The take on the hotdogs and burger were good with their own twists on the classics. The shoestring fries were really good. Excellent waitstaff, constantly filling our water and wine glasses. Very quick food service. Delicious butterscotch pudding for dessert. Great service and food. Only complaint of the night is downstairs got a little loud. Tough for conversations. Great ambiance. Beautiful place. Great cocktails. Wine by glass selection is so/so. Menu is a bit limited but with a handful of offerings done really well. Portion sizes way too small for price. Way too small. The burger was delicious and the Walking Dead cocktail was pretty. Music was good and atmosphere was cool. Everything was top notch from service to food. We enjoyed the pretzel, tomato dip, brussels, squash, steak(cooked perfectly with a "big mac" sauce) and tots (which were underwhelming). Get dessert, don't skimp! The ho hos and the apple hand pie are both worth every calorie! Great food and extensive alcohol list. The service was really slow on a busy Friday. Brussel sprouts were killer and they are willing to accommodate for special diets (ie lettuce wrap burger). Overall good experience dining in the lower level. I stopped in for a quick bite while on a business trip. Wonderful food in a beautiful setting. The octopus al pastor, Cubano frank and Brussels sprouts were all enjoyable though not outstanding. The apple hand pie with vanilla gelato was well done, but again, not something that we will be remembering in the long term. Noise level was higher than we would have liked for a date night. Poor service diminished an otherwise good meal. Not a fan of servers acting like they are better than you, which this one definitely did. If I were to return again I would only sit at the bar lest I have to deal with a server who was not altogether interested in actually performing his job or dealing with my party. The worst part is I was quite excited to eat here and reserved this while a good friend was in town from NYC, wont make that mistake again.. Awesome service, fantastic cocktails, and yummy food. Disappointing to say the least. I would definitely not recommend going here for a date night or romantic celebration. After specifying that we were celebrating our anniversary, and discovering that the downstairs area was closed for the night, the hosts decided to seat all following guests right next to us, in an empty restaurant! Tables are on top of each other, and we spent the evening listening to an interview on one side and a business dinner on the other. Only bright spot was Malcolm behind the bar, who was attentive and welcoming. The Saratoga treated us right on New Years Eve: it’s a great space w/ delicious food and friendly service. Look forward to returning again soon. Our servers were great. Really made our experience fun. Everything was prompt and presentation was so cool! We had a quick meal before seeing a show at the Curren Theater. The service was excellent! I recommend their hamburger and old fashion cocktail. The assistant manager sat out table of 7 for a surprise birthday dinner. I explained that I was vegan & she said the server would be able to help me with options. The server referred to the 2 ladies at the table with “my lady” which weirded them both out. It was not sad in a kind way. She was unable to tell the difference between gluten free & vegan. She sent the assistant manager over to assist. Luckily she could. Every drink took way too long to arrive. The place was not busy enough for the wait time. The server didn’t know what a greyhound or French 75 was & when we ordered a glass of champagne for everyone at the table, she didn’t suggest a bottle. Food was a little heavy on the salt. The food options are very limited, 5 options. None of the entrees come with anything, a side of greens or even something cheap like mashed potatoes. Its a la carte but priced differently. I had the steak, decent piece of meat; probably choice not prime; it came swimming in sauce like an au pouive. The fish was very nice, the better of the two dishes. The bar scene (at 8pm) was diminished. I hadn't been there in some time and clearly the enthusiasm of the opening year has somewhat receded as to be expected. Melinda at the bar mixed up some nice cocktails and was very embracing as always. The space is very nice particularly downstairs but they need some additional menu items, imo.